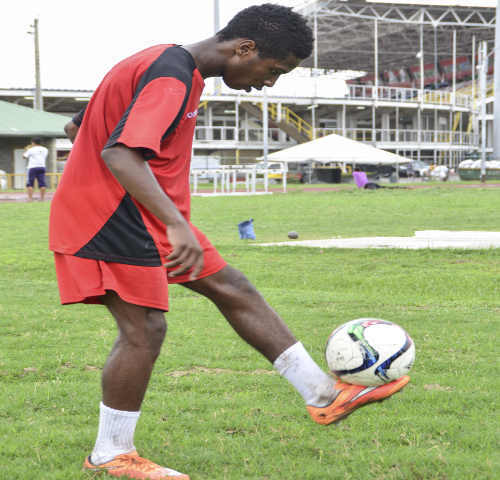 The energetic Shannon Gomez is one of Trinidad and Tobago’s young football stars. 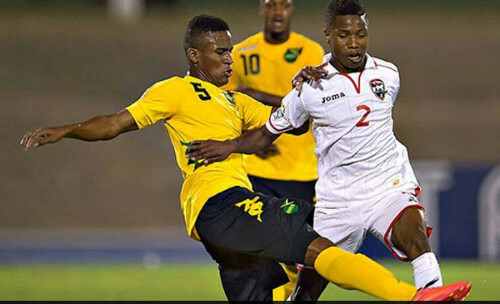 He was the captain of the National Under-20 Team and one of the few teenagers selected to play with the senior team this year by coach Stephen Hart.His best friends, Neveal Hackshaw and Akeem Garcia, both alongside him against the Panama Senior Team in March. Photo: Trinidad and Tobago captain Shannon Gomez (right) is tackled by Jamaica midfielder Allando Brown during CONCACAF action in Kingston. Although he was on the losing side in that outing, Gomez did not let the setbacks affect his positive attitude in training as he continues to look towards the future. Gomez is focused on taking his career to the next level, and maintains a level of fitness by always training, even when he is at home in Edinburgh 500, Chaguanas. The W Connection right back lives with his mother, Deborah Phillip-Charles and grandmother, Gladys Phillip, who he both admires for their contributions to his career. Among other things, they banned him from fast food and soft drinks and make sure he drinks plenty water daily. Chelsea FC, Stamford Bridge, never falling down so…Chelsea FC. Didier Drogba, the king, but… Didier is retiring, he’s leaving Chelsea, which is heartbreaking but life must go on. I started watching Chelsea because of Didier Drogba. Describe yourself as a person? I like to laugh, I like to make jokes, I like to make people laugh. You know sometimes your day might not be going good and I just come around with my ‘kicksy’ self and lighten up somebody’s day. I like to laugh; you know… that’s me. On the field of play sometimes they might say I do not get tired, but they don’t see where I might be jogging back a little slowly. And they might not see I’m taking in my oxygen… sometimes they (don’t) really know the kinda pain we go through on that field so. (He said with a smile). So you always trying to keep fit on your own? Since (I was) small, every time a season has finished, and (you return) to play football (next season)and you’re unfit. And you have to start over again to get fit. (I would) rather I just keep myself fit and done. (My) first club was Waterloo Institute, Cap Off Youths, then I went to St Mary’s United, then I transferred to San Juan Jabloteh. I grew up (at Jabloteh), they nurtured me. And then I went to sign to the professional deal with W Connection FC. 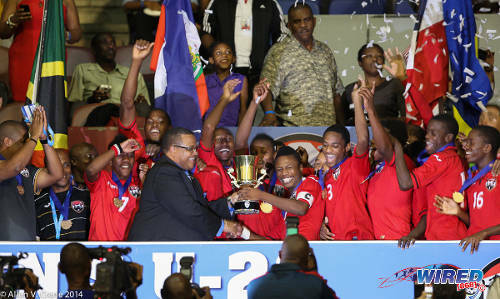 Playing with San Juan Jabloteh at the Republic Cup, and winning the Cup with them. And that was (one) of my first major trophies. Who is your most important coach? I had a few important coaches that nurtured me to become the player I am today. 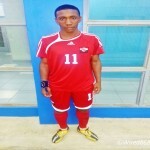 Firstly I would like to start with Dave Weekes from San Juan Jabloteh, who helped me technically to develop my football. Then on to St Augustine Secondary with Michael Grayson, who taught me a lot about different positions on the field of play (and) exposed me to the lifestyle you have to live as a footballer and that kinda thing. (He) played an integral part of my football (career). And last but not least, Stuart Charles-Fevrier who is helping me develop tactically in the game. And to get a contract on the outside. 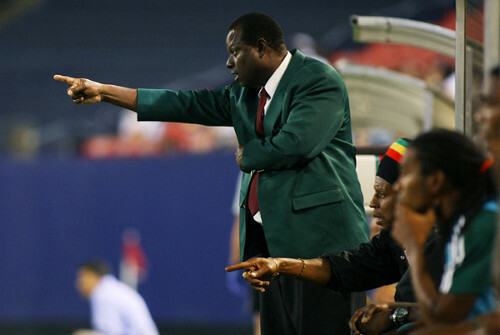 Photo: DIRECTV W Connection coach Stuart Charles-Fevrier (standing) points the way for his troops in this file photo. My fitness and my ability to attack (and) defend. To help give my team an extra burst of energy on the right side, so they always have an option on my side of the field. What’s your best moment in football? Ahhh… Every time you play for your school and you hear Intercol come around, sometimes it’s some of the best moments in your life, your school days. Winning the Intercol in 2013, ‘captaining’ St Augustine to the title, after twenty-something years. The intercol kept slipping away from us and winning it back in 2013 was one of my best feelings… One of my best trophies ever. We played against Fatima College (in the final). What is your ambition in the game of football? I want to take it to Europe, take it as far as the biggest teams in the world and play for them. Represent my family and friends and represent from Trinidad and Tobago with my full heart and soul. I want to make it and land that big contract on the outside. Photo: Trinidad and Tobago National Under-20 captain Shannon Gomez (centre) takes the Caribbean Cup trophy from CFU president Gordon Derrick. You just got back from Curacao, can you tell me about that experience? Personally, I think that it’s a huge stepping stone in my career. What was the attitude in the locker room moving forward after Curacao? 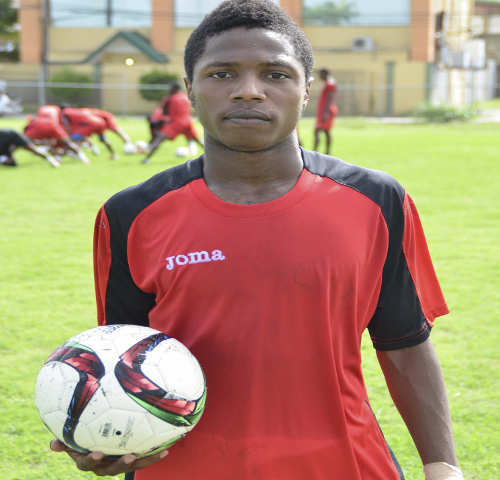 (It was) a hard loss to swallow for Trinidad and Tobago football.. I learned that you can’t take (any) opponent for granted, even in the Caribbean. What did you take from the senior team to the junior team? Tell me about your time at W Connection? (I joined) W Connection last August (and) since going there I have developed drastically (in tactical terms) under coach Stuart Charles-Fevrier… Some of the players there (are) also high quality players like Mekeil Williams, Neil Benjamin, Alvin Jones, Jomal Williams, who are young rising stars also on National teams… W Connection FC has drastically helped us to develop our football and improve as players in the country. 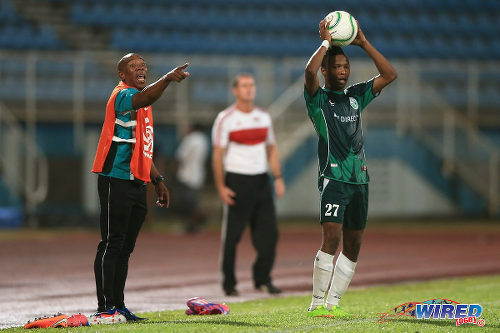 Photo: W Connection assistant coach Earl Jean (left) barks orders at his squad while right back Shannon Gomez (right) prepares to take a throw during the 2015 Caribbean Cup final. Pros of the Pro League? It’s like a sandpaper. It helps to sand you down and help you to sharpen up yourself to make that big contract on the outside, to help you to promote Trinidad and Tobago’s football. So the Pro League is one of the big stepping stones in Trinidad and Tobago. What pushes me to succeed is family. Family is my strength. Everything they’ve done for me up to today. Even my grandmother, (who) is an icon in my life, and my mom who (has) been working double roles as dad and mom. Family just pushes me to do my best and (I want to) give them back in the future although you can’t repay them for things they have done, I just want to make them to know that I understand what they have done for me and they are my motivation. Tell me about your family support for your football? Well, right now my mom and grand mom (are) the back bone of my operations in football; because they support me financially although I make my own money in football. They still make sure I’m intact and I’m fully fit and ready. They banned me from certain foods; they don’t let me go out and eat certain foods because they know how serious the sport is. Does your mom come to your games? Mom is mainly behind the scenes but she comes to the key games, (like) semifinals (and) finals. She wants to see me pull out those big performances. She feeds me well and she wants to see where her food goes. So she comes to see the big performances. 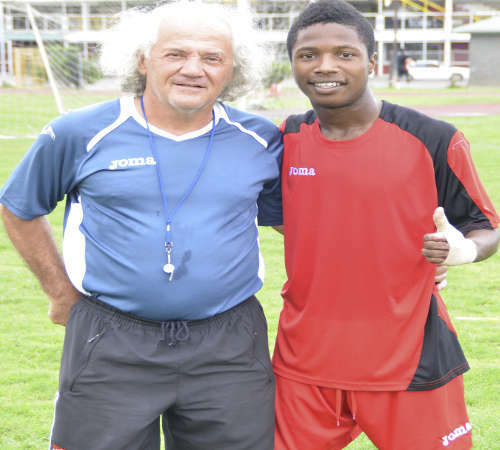 Photo: Trinidad and Tobago National Under-23 coach Zoran Vranes (left) and Shannon Gomez. Personally, (I am) trying to make it onto the senior team for the (2018) World Cup Qualifiers as we have… I want to go out there and play to the best of my ability (in the 2015 Pan American Games) against teams like Uruguay, Paraguay and Mexico that can land me the big contract on the outside. I would also like to win the league title with W connection before I leave.